Effortlessly program your mind for automatic success — Become the subliminal winner you've always wanted to be. The easiest way to achieve a more positive, productive life! 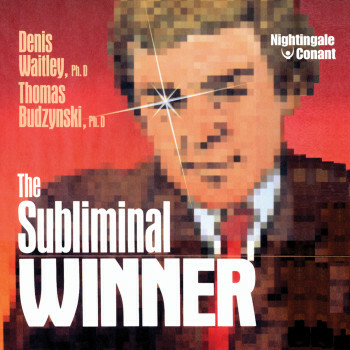 Using state-of-the-art sound technology that incorporates empowering subliminal messages into harmonious music or relaxing ocean sounds, this highly-effective audio program — The Subliminal Winner — will automatically train your mind toward more positive, productive patterns of thought and behavior. Simply by listening to The Subliminal Winner by Denis Waitley, you’ll experience a noticeable improvement in the results you’re getting in just about every area of your life! Denis Waitley is the world authority in helping others achieve their full human potential. He did it first with his audio program, The Psychology of Winning, and with an impressive body of work produced since that initial offering. Mr. Waitley constantly increases his knowledge by unending research that often takes him to the outer reaches of human potential. He has studied and counseled winners in every walk of life from top executives of Fortune 500 companies to Super Bowl champions, astronauts and returning POW’s. From 1980 to 1984, he served as a member of the United States Olympic Committee’s Sports Medicine Council, dedicating himself to enhancing the performance of our Olympic athletes. He is one of the world’s most sought-after speakers because he communicates complex and profound truths in interesting, easy-to-understanding language. Denis Waitley is a graduate of the United States Naval Academy.